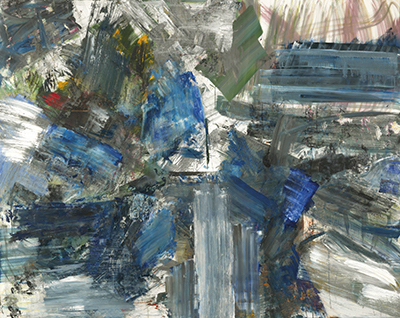 William J. Simmons interviews painter Louise Fishman. A Retrospective of Fishman's work is on view at the Neuberger Museum of Art through July 31. Concurrently, Paper Louise Tiny Fishman Rock is on view at the Institute of Contemporary Art, Philadelphia through August 14. Fishman comments: "... it has always been a problem for my career that I am one, queer, two, a woman, and three, doing plain old abstract paintings. There's not the subject matter that you see in other lesbian work—subject matter makes things more accessible and easy to write about. Abstract painting is not easy to write about. However, being outside of the system allowed me to separate myself from everything out there, and to develop how I wanted to... there's a lot that comes out of my studio that's just me."